My research is motivated by a concern for how violence is represented, aestheticized and reconciled within culture. In self-directed projects that embrace both the methodical and the expressive, I create revealing, exploratory and participatory experiences and develop a variety of narrative approaches to addressing complexity. I focus on the ways that art and design critically shape our interpretations and promote understanding. My current work, The Evolution of Silence, addresses the damage brought about by several decades of nuclear testing at the Nevada Test Site. The web-based archive translates fragments of archival data into an exploratory engagement with the 828 individual detonations. Providing access to this restricted desert landscape, layers of the project offer historical perspective on the cultural view of the bomb and on the human toll of war. Examining the impact of events and their dynamics, I create critical interactive experiences whereby the viewer actively dismantles the aggregate image of war and confronts the scale of violence that has taken place. The Evolution of Silence addresses the scale of damage brought about by 41 years of nuclear testing at the Nevada Test Site. 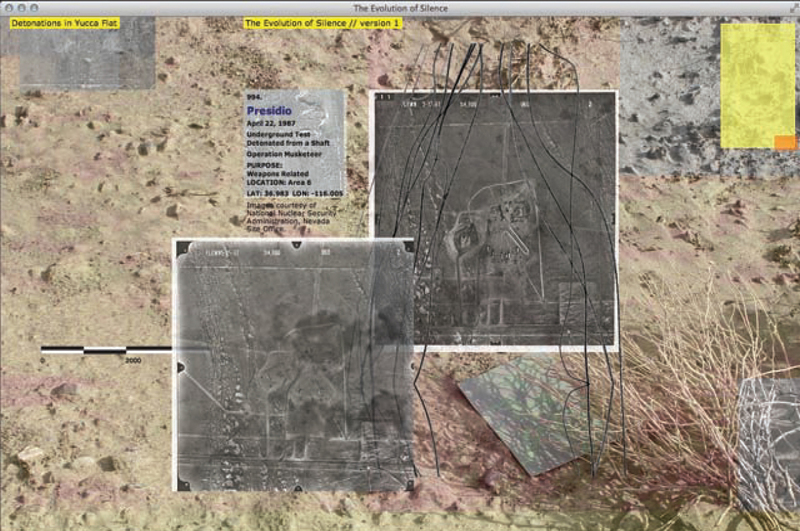 The web-based archive presents a non-linear map and interpretation of the area’s destruction and an opportunity to explore this restricted desert landscape. 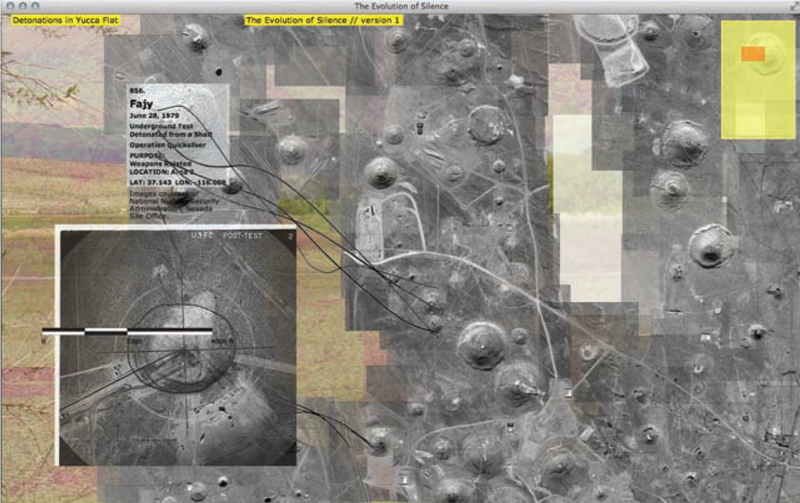 The project translates official government data of nuclear testing into artistic, reflective experience and presents an imaging of a landscape symbolic of war’s aftermath and silence. 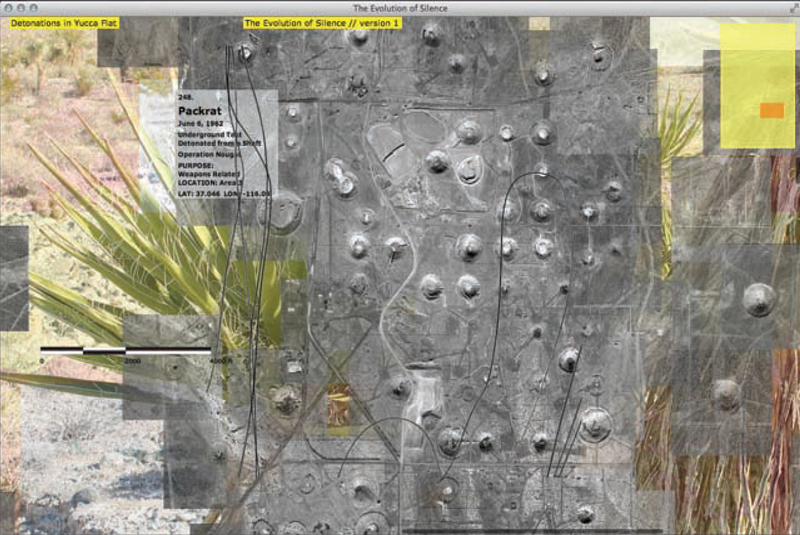 In mapping the location of the 828 individual detonations that occurred in Yucca Flat alone, I focus on the “before and after” of transformation and on the traces that remain. Art, design and research by Rachele Riley. Technical consultancy and development by Danniel Gaidula. Satellite images are courtesy of the DigitalGlobe Foundation. Archival images are courtesy of the National Nuclear Security Administration/Nevada Site Office, the Nevada Test Site Historical Foundation, and the National Archives Photography Collection. This project has been made possible in part with grants from the DigitalGlobe Foundation, the University of the Arts in Philadelphia, the University of North Carolina Charlotte, and with individual contributions made directly to the project via Hatchfund.